Do you have an idea but you don’t know whom to contact?Do you want it to culminate in reality but don’t know which path to follow? 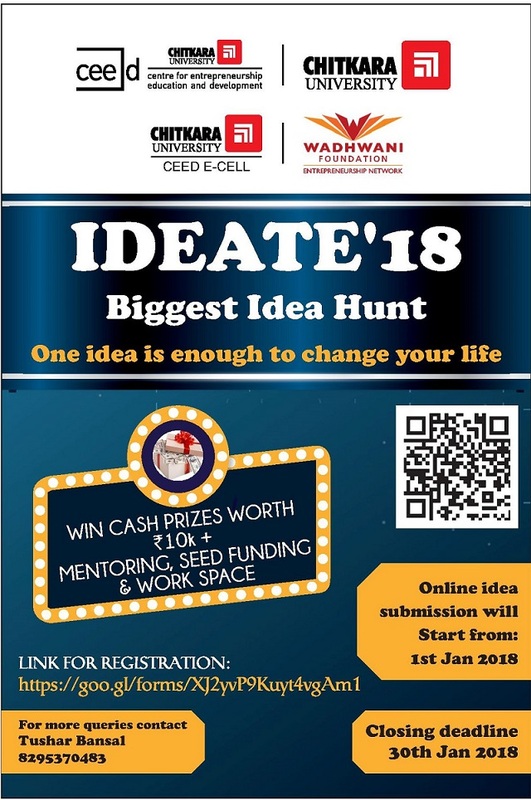 Centre for Entrepreneurship Education & Development-CEED, Chitkara University, Punjab in association with Entrepreneurship Cell and Wadhwani Foundation National Entrepreneurship Network presents “IDEATE”-an online idea submission competition. .An idea that can turn into a multi billion dollar company. It gives you an opportunity to win assured cash prizes upto Rs 10k, seed fund and workspace.